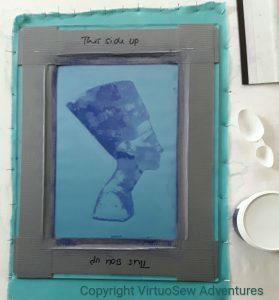 You may recall that the final “Dreams of Amarna” pair of panels is intended to include the heads of Akhenaten and Nefertiti, screenprinted onto gauze, and floating over the top as free-hanging veils. 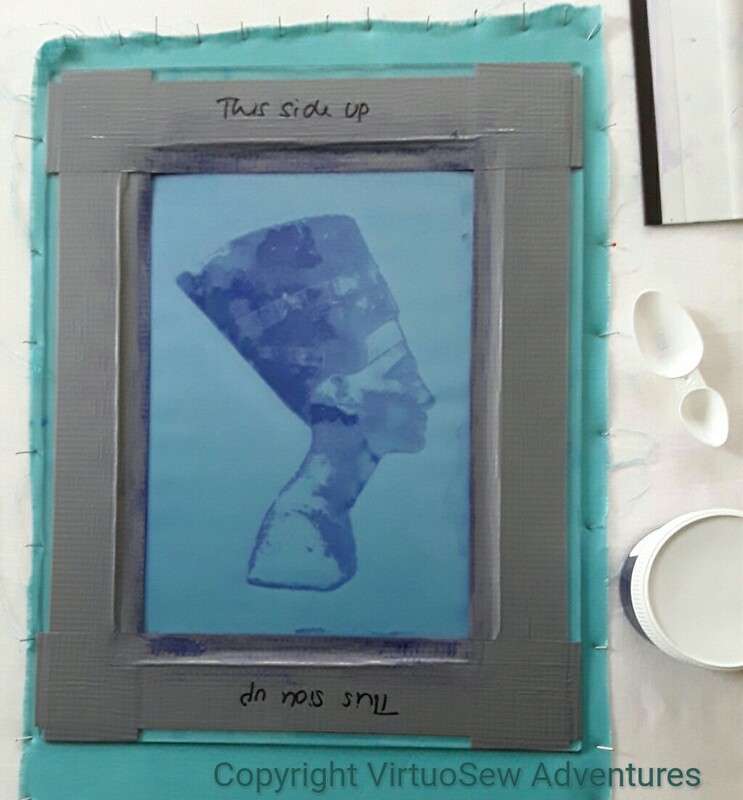 I decided to have a small screen done of Nefertiti, in order to practice the technique and experiment with the different types of gauze. The screen duly arrived, and I did about six prints, all of which were dreadful. I put the screen away in disgust and decided to try another time. This print shows some of the problems. I pressed too hard, obscuring some of the detail and caking the fabric – in this case a linen, because I have a plan to add silk and gold embroidered highlights. It would be impossible to get a needle through, and if I did, a metallic thread would be stripped in short order. There’s clearly a trick to it – a combination of pressure (not too much), amount of ink (enough!) and angle of the squeegee (just right). These two prints on gauze give me some hope. The orangey-terracotta is the small, blocky screen I bought to test out the idea first of all. I’ll embroider something over the top of this, just to see how it works. 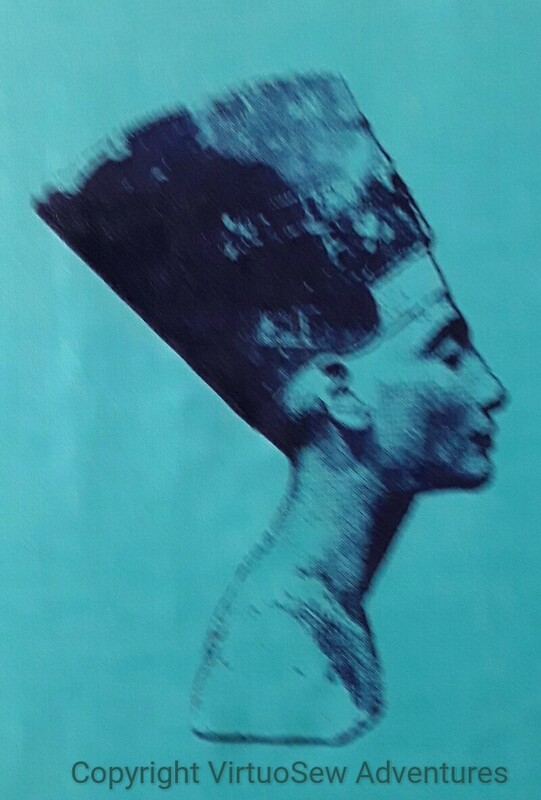 And the head of Nefertiti is rather better, too. Next time I get out my Dreams of Amarna pieces to stare at them and play with layouts, I will be able to hang the gauze in front and play with distance and placement. I’m beginning to think that it isn’t outside the bounds of possibility that I might finish the Dreams of Amarna one of these days, and even be pleased with it! The gauze print looks perfect to me. Considering that this is supposed to be part of an archaeological dig it shouldn’t be too ‘perfect’. I love this technique. It’s a quite new technique to me. Very interesting. Don’t give up. Swear at it, put it away but keep trying. You will crack it. I think you are on a roll with the gauze–the print looks great. With Nefertiti’s long, slender neck, I wonder how heavy her head dress was and how tiring it would have been to wear it. This is going to be amazing! You are so clever – I’m sure you’ll get there. Yes, the gauze looks good in the photo. As I’ve said before, I still think your gauzy overlays should be hinged somehow, like cupboard doors, so that people can also enjoy the panels below in their full glory. The gauze looks good.Printing on a gauze is a lovely idea. I love that last print on gauze. The gauze print is lovely. Thermofaxes are difficult beasts at times, they don’t behave like screen prints and can be messy I’ve found. That’s ok at times but at other times I have made several prints before I have what I want. I like the texture print too; the whole piece is so well balanced. Love the one on gauze – it looks like something that could be stitched through reasonable well. I love your descriptors of the different stages of the process by the way – I got a real sense of what it must have been like for you to experiment with the process!